I saw a 17 and a half foot Folbot Kayak for sale cheap on the Tulsa version of Craig's List today. With room for 2-3 paddlers onboard it sounds like quite a bargain at less than $400. Lots of folks willb be putting their kayaks on sale now that summer is over. Time to start kayak shopping! I got a chance to paddle my good friend, Greg's 15 foot Dagger Edisto touring kayak this Summer. It is a real deal Sea Kayak with a rudder and everything. You squeeze into this boat like an extremely intimate pair of shorts. The cockpit is so small, I think I could have used a rubberband for a spray skirt! Where my recreational kayak has sturdy foot pegs to transfer the power of my paddling stroke to moving the boat, the touring kayak has pedals attached to the rudder via rope or something. I do not like paddling with a rudder. Touring kayaks don't really suit me for paddling in Oklahoma. The extra length in the water line does make these long kayaks slip through the water with a bit more ease. However, the longer boats tend to catch more wind. A shallow drafting boat like the Dagger Edisto can weathercock quite a bit in Oklahoma's nearly perpetual winds. Trying out different kayaks is always funfor me, but so far, I am a hooked on the recreational kayaks like my Perception Swifty or Dianne's new twelve foot Vapor Angler XT kayak from Old Town. Her 12 foot kayak offer much more carrying capacity, it is quite a bit faster than my Swifty and is one of the quietest, most comfortable kayaks I have ever paddled. I would like to paddle a few foldable kayaks. I tried a cheap inflatable kayak, but I found it to be WAY more hassle than I want to add to my paddling trips. I haven't really tried any of the folding kayaks yet, but they do look compelling. My 9.5 foot plastic kayak won't fit easily into most vehicles, but it is tough as nails and always ready to hit the water when I am...no waiting required. Saturday and Sunday both look like they will offer warm temps and low wind. Local lakes and rivers are mostly devoid of other boaters and the Fall color is quite vibrant. This is an awesome season for canoeing in Oklahoma. Find yourself an inexpensive recreational kayak, a cheap digital camera and embrace the sweet nectar than is Autumn. Of course, if you don't want to buy a kayak, you could always build your kayak. The recent week of showers in Oklahoma have opened up the Fall canoeing season. Water levels are up on rivers and creeks throughout the Ozarks. Our local Okmulgee Lake is running strong over the spillway. Head down Highway 56 west of Okmulgee and you can see our local part-time waterfall from the highway just west of the park entrance. This is the classic backdrop location for an Okmulgee family photo. If you happen to be paddling Okmulgee Lake...better not get too close to the Dam. That way lies MANY trees you will not enjoy paddling into. Al and the Oklahoma Flatwater Paddlers have a Buffalo River trip planned. The Kiamichi River is up again after a long dry summer for Tom & the Gang at Kriver.com. I would love to get a weekend free to head down to Antlers, OK and paddle the Kiamichi and the Buffalo River is breathtaking in any season. BTW, did you catch the recent PBS special on the Buffalo National River? It was called The Buffalo Flows - The Story of Our First National River...an excellent story of the efforts to protect that free flowing gem of the Ozarks. If you have never paddled the Buffalo River, I highly reccomend you make the trip this Fall. 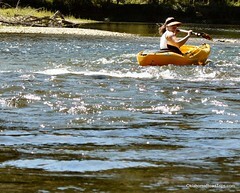 It is a breathtaking river, perfect for canoes and recreational kayaks. Since it is about a five hour drive for us, we only visit the Buffalo River during the Spring & Fall canoeing seasons when the color is blazing. Dianne recently bought her five year fishing license, so she is eager to drown some goldfish. I think I am going to follow her lead. Anybody got any tips for cool weather fishing in Oklahoma? Right now, our part of the North Canadian River is up and running fast. The Deep Fork River is also stretching out across the bottoms around Okmulgee County. A bit of warm sunny weather on the weekend would be right on time. Also check out this link to a Kansas outfitter: Brooks Canoe & Kayak - they rent those cool pedal powered Hobie kayaks, I've always wanted to give one a try and Wichita is not too far for a road trip. Participate, observe or simply learn more about the many activities that make River Parks Tulsa's favorite park, recreation and entertainment destination at Tulsa River Rush 2009! Visit booths sponsored by a multitude of local clubs, organizations and businesses including: the Tulsa Rowing Club & Kayak Club. The River Activity Expo begins October 10, 2009 at 7:30 a.m. Check http://www.riverrush.net/ often as additional groups are added. To register an organization or business for participation in the River Activity Expo, contact tpitzer@riverparks.org or call (918) 596-2010.